Floor van Meer (1986) studied Clinical and Health Psychology at Utrecht University and graduated in 2010. 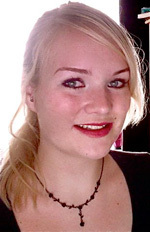 During her Master's she completed her thesis and internship at Altrecht Eating Disorders Rintveld. She finished a MSc-thesis on neuropsychological weaknesses in chronic Anorexia Nervosa patients, as part of a larger fMRI study of brain responses to food stimuli and relationships with cognitive functioning in AN. After her MSc degree she worked as a research assistant on different projects with Rintveld and the Experimental Psychopathology department of the Utrecht University. Since March 2012 she works as a Phd-candidate at the Image Sciences Institute, UMC Utrecht on the 'I.Family' study, an EC-funded FP7 project that aims to investigate determinants of food choice, lifestyle and health in European children, adolescents and their parents. As part of this project she is examining the neural correlates of healthy and unhealthy food choices in children and their parents. fMRI during food choice is used to see if the food choice process of children differs from their parents, and if healthy eating people have different brain activation during food choice than unhealthy eating people. Additionally, brain activation in response to food viewing is investigated, as well as the relationship between food induced brain responses and neuropscyhological characteristics.